TN Police Constable Previous Question Paper: The Tamil Nadu Uniformed Services Recruitment Board is going to conduct the Grade-II Constable, Jail Warder, and Fireman Exam in the upcoming months. The recruitment board is organized the written examination for the TN Police Constable Recruitment 2019. Here we have provided the TN Police Constable Question Paper to get start preparations. Candidates can start their practice with TN Police Previous Year Papers to increase more speed in attempting the exam questions. Candidates can score the highest marks in the exam with help of TNUSRB Jail Warder Model Paper with Answer. Latest Update: TNUSRB is going to conduct the TN Police Constable, Jail Warder, Fireman Exam 2019 in the upcoming months. Aspirants can download the TN Police Constable Previous Question Papers, model paper from here. The Tamil Nadu Police Constable, Jail Warder, and Fireman Previous Year Papers are available here. The question papers are useful for the exam study and candidates can practice in a good manner. Candidates are informed to study the Tamil Nadu Police Fireman Exam Questions Paper on a daily basis if they want to select in the Tamilnadu Police Department. Candidates should start solving TN Police Constable Sample Paper in Tamil. By solving these exam papers, candidates can improve their skills and confidence level for the police Exam. The TN police exam will be conducted for the candidates who want to enhance their career in Defence Jobs. Applying candidates can Check TN Police SI Question Papers to score well in the examination. Candidates are advised to work hard to qualify the Police Exam with good marks. You can prepare the best for the exam according to the Previous Year Question Papers. Here we have provided the TN Police Exam Syllabus 2019 which helps the candidates in the exam study and will give the knowledge about the subjects and their topics. 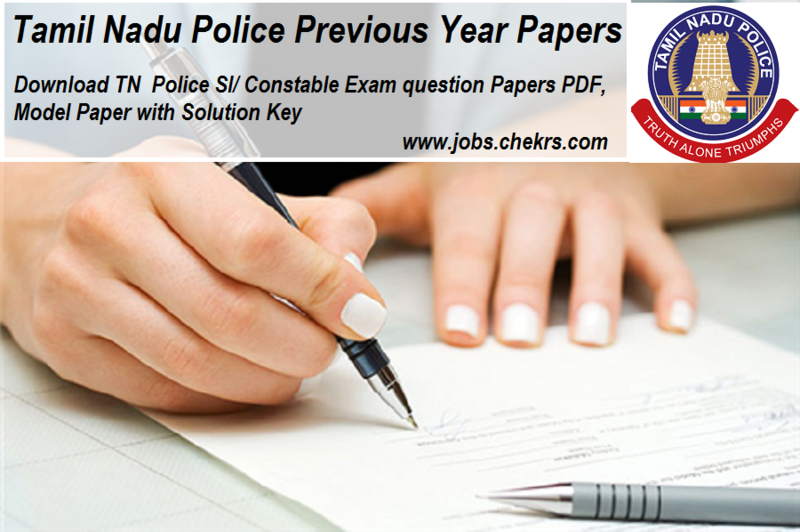 Tamil Nadu Police Exam Question Papers is now available in pdf format. Candidates can download the exam papers pdf to get the proper knowledge about the exam pattern. Candidate’s selection will be made on the written examination, physical test, and Interview. For the written exam preparation, candidates have to need TN Police Constable Previous Question Papers which help a clear idea about the questions types and latest trends. You can visit our website www.jobs.chekrs.com for all Police exam old question papers. In the case of any query or review, we welcome your valuable comments in the commenting section below and we will revert you in a short while.